If you're crossing through Hyde Park in the next few weeks, you'll probably run into an outdoor gallery of candid shots challenging our views of 'Australian identity'. Australia attracts photographers from far and wide hoping to snap a panorama of a beachscape, or glittery lights over the harbour on a summer night. However, you won't find any of these cliché shots at Art & About Sydney's Australian Life exhibition. Sent in by professional and budding photographers from across the country, the photos look further than the usual subject matter, depicting a fleeting moment or a seemingly mundane point in time, somewhere in Australia. But, each photo has been chosen as a captivating masterpiece that represents an alternative view of the Australian identity. Out of more than 1300 entries, 22 were selected by a panel of artists, curators and photographers, as the best representations of everyday life in our fair country. Here, we examine five works from the exhibition and spoke to the five photographers about the context of these images and why they chose to capture this portion of Australian life. 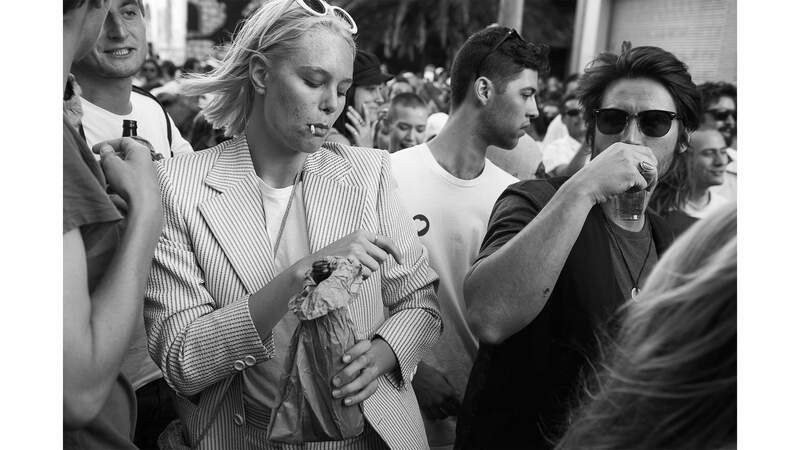 For his take on Australian living, fashion and event photographer David Hufton captured the unavoidable rabble of Newtown's huge annual festival — last year, 90,000 people hit the streets in a massive throng. "The photo is about absolute momentary freedom," says Hufton. 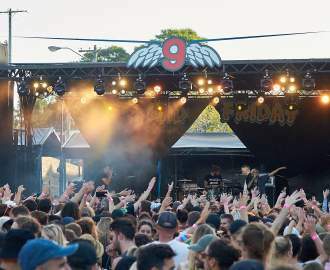 "It is a moment and time where these young people organised their own street party, with music, alcohol and a Fijian exotic dancer to express their joy and freedom, without society's excessive rules." In this photo, Hufton shows a number of attitudes that flow freely through the suburb's diverse local population. "It was great to shoot some stills that expressed their natural joy and sense of community. I noticed that they celebrated being themselves — independent, strong and proud. They carry so many of the good qualities of Australian society: respect for different people's genders, fashion and respect for other young people's varied lifestyles. The photo expresses personal freedom and exuberant joie de vivre." Newcastle Ocean Baths have been a popular place for a weekend splash for about a century; the eye-catching, historic art deco pavilion and pool make it a Newcastle landmark that attracts swimmers, sun worshippers and often, a few newlyweds. "I love wedding assignments because you never really know what you're in for, and that can make for all types of opportunities from behind the lens," says Paul McMillan. 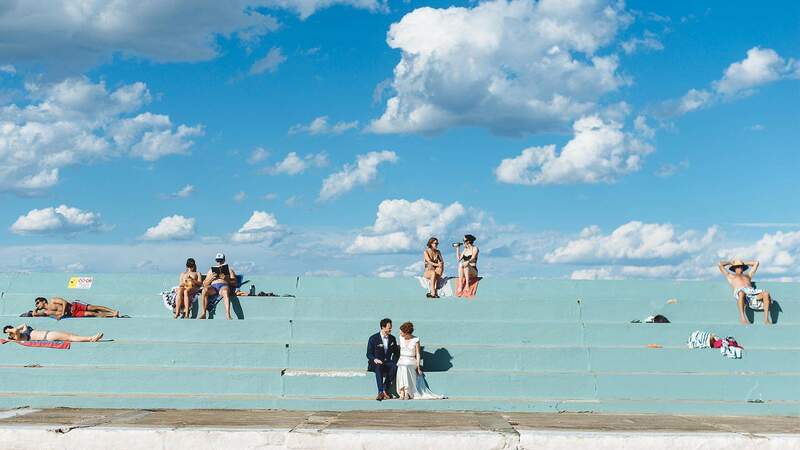 "I never used to include surrounding members of the public in my wedding portraits, but these days, I realise that it's all part of it, and just gives a much more realistic look at life on that day." McMillan is interested in how each person is comfortable in their own space. 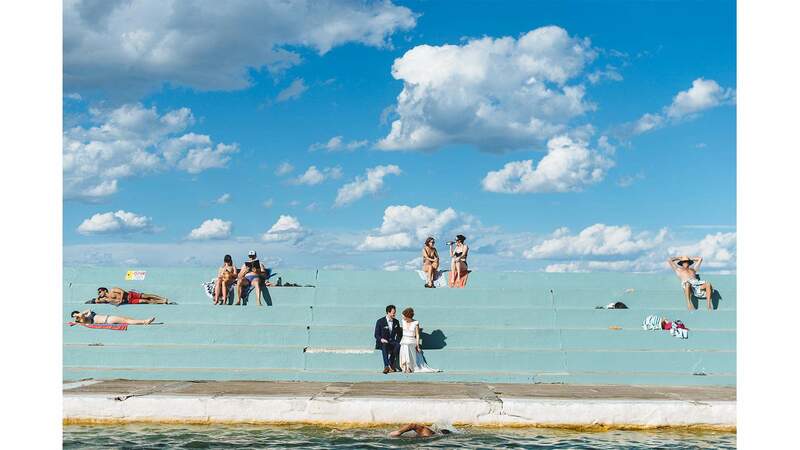 "Even though there are a couple of newlyweds in the middle of the frame, it's somehow normal, and that represents the melting pot that is the baths and the attraction of the water," he says. "It's inclusion in its most basic form." In her take on life in Australia, Natalie Grono has captured the youth surf culture of her northern NSW hometown, Lennox Head. "The image depicts the ultimate in Australian life: friendships made with a love of the outdoors, epic afternoon sunlight and the growing freedom that children experience," she says. But Grono also wants to show that though surfing has, for a long time, been dominated by males, women and girls are more and more involved in the sport. "The tides are turning as surfing gains increasing popularity amongst females Australia-wide. I made this portrait of local girls who find empowerment and friendships through their shared interests," she says. "When you are elderly, does time still fly?" questions Jonathan Armstrong. 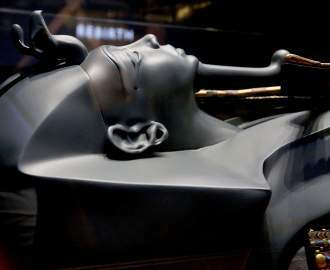 "I wondered this while hypnotised by this woman's piercing gaze, and was struck by the bonds that outlived a fleeting kiss on a public street. How long ago did she make the journey from there to here? Did it fly by before she even turned around? Or did it take an eternity?" 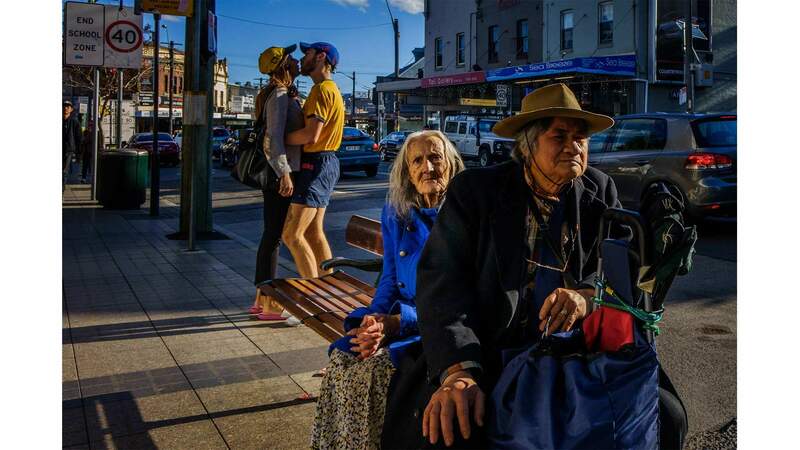 Armstrong's photo asks us to consider how we perceive the passage of time, depicting an elderly couple mirrored by a younger couple on Victoria Road in Rozelle. "I saw the scene in the photo unfolding in front of me as I approached: the elderly couple sitting together at the bus stop, the woman gazing at me intensely and the young couple swept up in a passionate embrace that was in the process of unfolding imminently. And I couldn't help noticing the irony of the traffic sign which said 'End School Zone' — a perfect summary of this scene. I squeezed the shutter release just before the young couple's lips touched." For Vienna Johnston, this young woman at a local caravan park represents a reflection of Australian holiday culture of yore. "I grew up on the Central Coast in NSW, and live in a little waterside town called Long Jetty," says Johnston. "These coastal towns are littered with beautiful fibro homes and little caravan parks, but as the housing market is booming, we are slowly losing that retro charm for more modern structures." It's also an observation of our changing holiday habits. "As caravans are being switched up for Airbnb, who knows how long these old places will exist?" Wander over to Hyde Park to see these photographs and other depictions of Australian life at the park's fountain, showing from Thursday, September 14 to Sunday, October 8.